The Red Hills Salamander is a large species of lung-less salamander that are adept at burrowing and spend the majority of the day underground, only emerging at night to hunt for food. The Red Hills Salamander is currently listed as endangered as its losing its forest habitat to pine and timber harvesting firms. 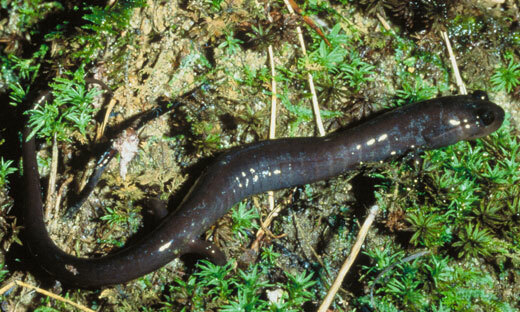 The Red Hills Salamander belongs to the largest family of salamanders, the Plethodontidae. The Plethodontidae make up 70% of all living species on the planet. The Plethodontidae are unique in that they do not posses lungs but rather breathe through their skin. It is believed that the reason evolution has taken this direction with the Plethodontidae is that the vast majority of these salamanders used to dwell in or around steams and rivers, getting rid of lungs means that there is less chance of the salamanders floating away as having no lungs greatly reduces buoyancy. Breathing through their skin rather than lungs does pose some restrictions for Red Hills Salamanders however as in order for them to be able to breathe through their skin effectively they must keep themselves moist and not let themselves dry out which leads to the Red Hills Salamanders being nocturnal. Another issue is that of size restriction as in order for the Red Hills Salamanders to increase in size they need to take in more oxygen which leads to them needing more skin to breathe through, this is the reason for their long shape that maximizes surface area and skin. The Red Hills Salamander makes its home in the forests and ranges of central Alabama living on damp slopes with plenty of tree coverings and foliage. The burrow of the Red Hills Salamander is temporary, needing to be re-built or repaired every couple of months due to constant erosion but it is here that you are most likely to sport a Red Hills Salamander, especially at night as this is the only time they venture forth into the wilderness and even then only for short periods. Male Red Hills Salamanders have glands below their chin which excretes pheromones in mating season, this is used to attract a mate. Upon a successful mating it is believed that the eggs are deposited deep within the burrow but no eggs have been found out in the wild so its not a certainty and it isn’t clear as to if the male Red Hills Salamanders go through any effort to protect their burrows. The Red Hills Salamander’s lifespan can reach up to around 12 years and their main food source is anything that can be found close to their burrows such as snails ants and spiders.